Ronald Reagan famously asked this question during the 1980 presidential campaign. It was a winning slogan. It’s a great question to ask yourself. Are you better now? Is life better now? Step 1: Select your country of birth. Step 2: Select your birth year. So do you think life expectancy, infant survival, income per person, food supply, years of schooling went up or down. I think you know the answer. Of course these stats don’t portray the whole picture, but it gives you a sense. Crime’s lower. Civil rights are greater. Travel and communication are easier and better. And so on. What was most interesting for me was doing Step 3, which you’ll find below the bar graph generated from your information. In Step 3 you can compare life in the United States to other countries (or if you aren’t an American, compare your country to the US). What you find is that most other countries have grown more than the US. This should not be surprising. Remember that the US possessed half of the world’s industrial output at the end of 1945 because much of it–think Europe and Japan–had been destroyed in World War II. There’s really only one way to go for most of the world, and that’s up. The developing world has gone up up up in the past half century since decolonization, the end of the Cold War, and globalization. I’m an American who’s been to every state. I feel I know the country pretty well, though I’m sure I’m full of bias, incomplete information, and misinformation. But I don’t suspect that most Americans get that the US probably won’t grow like China, India, and the developing world. There’s not much slack in our system. So when people want to “make America great again,” I have a thought. 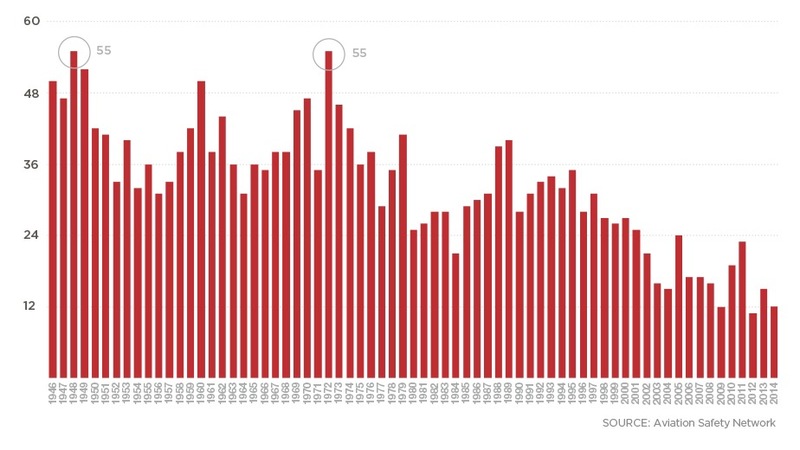 America is greater than it’s ever been. Better educated, longer lived, healthier, freer, more affluent. But rosy retrospection makes many pine for bygone days that exist only in their reconstructed memories. I’m fine with reconstructed memories. Just don’t vote or base public policies on reconstructed memories. 50 Years Ago. Better or Worse? Compared with 50 years ago, life for people like you in America today is…. “Worse” say most Trump voters in a recent Pew Research Center Survey. Eighty-one percent said as much (above). Only 19 percent of Clinton voters said that. Trump’s biggest supporters were white men, nearly two-thirds of whom voted for him. Life for white men may have felt better because they had privileged access to higher education, social stature, political office, and good employment. These good things in life were limited for everyone else. I argue that life’s better for even the privileged white men of the 1960s. To compare 1966 with 2016, let’s start with a sentimental journey. It feels worse in 2016, right? There were no mass killings in 1966, yes? …except for sniper Charles Whitman who killed 13 and wounded 31 at the University of Texas. And don’t forget Richard Speck, who murdered eight student nurses in their dormitory. And Valery Percy, a Senator’s daughter, was stabbed and bludgeoned to death in the family mansion on Chicago’s North Shore. And there were race riots in Lansing, Michigan. Oh, the simple days before wanton violence! We could also talk about the 6143 young men who died in Vietnam in 1966. Okay, so maybe things were pretty sordid in 1966. Communications: Remember that thing called long-distance? You can call anywhere for free now. And communicate in most any way, to anyone, anywhere. For free. Economy: Despite much fear, the economy is flying high. Unemployment is low, the stock market is high, home ownership is not far from its all-time high. The middle class is smaller than it used to be, but this is mostly due to growth in the high income category. Education: In 1966 about 50% of whites and 30% of blacks graduated from high school. Today 87% of whites and 73% of blacks graduate. This is only one measure, but it reflects incredible educational progress in my lifetime. You can complain, with some justification, about the state of American education, but it has never been better. Environment: 1966, nestled between Silent Spring and The Population Bomb, is about the time when the modern green movement took shape. The The Cuyahoga River was once the most polluted river in the United States, made famous because it caught fire in the 60s…that is, the 1860s. Over the next century it would catch fire at least 12 more times, leading to the infamous 1969 fire that launched the environmental movement. People think pollution is a new thing, but pollution was much worse in the 1800s and most of the 1900s when there were few environmental regulations. Today, across America, air and water quality are better than they were in 1966. Food: Suffice it to say that food is so cheap and abundant that obesity, not starvation, is the bigger health threat. There’s no strong proof that legal pesticides or GMOs cause health problems. You can even get fruit in winter shipped from across the planet. People may complain about “food miles,” but maybe they should complain about “clothing miles” or “natural resource miles.” Just about everything is from everywhere else, and we seem to be doing all this trade with less and less pollution. Transport: It’s easier, safer, and cheaper. The chart below shows how many commercial airplanes crashed around the world each year. The decrease in crashes is more than threefold, even though air travel has increased a great deal. Looking globally, the improvements are much greater. Here’s a comparison of then and now, from yourlifeinnumbers.org. In 1966, average life expectancy was only 56 years. Today it’s 72. That’s an increase of 29 percent. Out of every 1,000 infants born, 113 died before their first birthday. Today, only 32 die. That’s a reduction of 72 percent. Median income per person rose from around $6,000 to around $16,000, or by 167 percent – and that’s adjusted for inflation and purchasing power. The food supply rose from about 2,300 calories per person per day to over 2,800 calories, an increase of 22 percent, thus reducing hunger. The length of schooling that a person could typically expect to receive was 3.9 years. Today, it’s 8.4 years – a 115 percent increase. The world has become less authoritarian, with the level of democracy rising from -0.97 to 4.23 on a scale from -10 to 10. That’s an improvement of 536 percent. Here and overseas, life is much better. It may feel worse, but that’s probably just your rosy retrospection calling the tune. We tend to think the past is better, especially as we get older and memories are recast in a glowing light. But it’s not, and making major political, economic, governmental, and social decisions based on false assumptions might just undo the progress we’ve made. Interesting you should ask. I like a lot of what Robert Reich says and thinks, but I am for free trade. I’m definitely a non-professional economist, but I do believe that most of the “rise of the rest”–the rise of more than a billion of people out of poverty as well as the expansion of the middle class in BRIC (Brazil, Russia, India, China) and other countries–is because people in developing countries can participate in the global economy more easily. NAFTA was mostly good but bad for people with high-paying industrial jobs who were out-competed by lower wage folks in the developing world. …I don’t put American jobs ahead of Mexican or Chinese jobs; I’m a utilitarian in this regard: “most good for the most people.” Nearly all forms of protectionism are bad, IMO. Even though I’m married to a highly paid union worker, I think unions are mostly bad nowadays except in low-paying industries where workers need protection. Nowadays “Old Labor” protects the already entrenched (not the neediest). The rights that unions fought for in the 20th century have mostly been granted by law. There’s undoubtedly a squeeze on the middle and working class right now in the US. I’m all for tax increases on wealthier folks (like me, frankly, though I’d like to believe I’m middle middle class) and public health insurance, and a decrease in all the gov’t welfare the RICH get in this country. (I have no qualms with helping the poor with gov’t money, but not the rich!) That said, much of the squeeze on the middle and working classes is because the world is more fair. We in the US had huge advantages, and globalization is taking those away…which is fair! All the more reason to invest in infrastructure and education right now! Thanks for asking and I hope you have a good week (despite much snow). As I said, I made some sweeping statements (as did Robert Reich), but I’m happy to dig into them. Do you agree or disagree about unions, free trade, “The Rise of the Rest,” etc.? As I’ve written in earlier posts, the Malthusian Trap–known in recent decades as “The Population Bomb”–is not a trap…and if it’s a bomb, the bomb’s a dud. 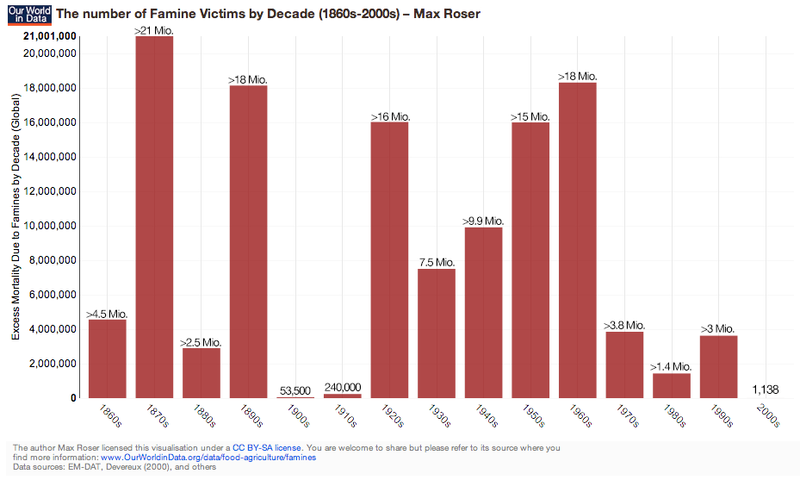 Max Roser’s graph shows how famine has declined in recent decades. “One of the many reasons for declining food crises is increasing food trade – shocks to local food markets (due to weather or plant diseases) are thereby absorbed. In a recent online argument with an anti-GMer, we sparred regarding whether or not GM foods have a bigger yield than organic or permaculture foods. He argued that yield wasn’t important because we have enough food, it’s just a distribution problem. I countered that this was because food has become so abundant in most places that people can afford to let it rot. Additionally, as people become wealthier they’ll eat more meat. That’s what’s happened as affluence has spread. I’m a vegetarian so I’m not even in favor of more meat consumption. It’s an economic inevitable barring some major change in norms regarding eating meat. Now I don’t like it if a single piece of food to rot, but this problem of abundance is a higher class of problems. Modern famines are caused more by governments not allowing its citizens access to food more than anything else. And yes, there are distribution problems, caused (again) by oppressive or incompetent governments. Freer markets and better governance are important trends that mean famines are becoming less and less common. Ebola, ISIS, school shootings. Michael Brown and Eric Garner, Ukraine and Russia, Israel and Hamas. It’s been a bad year for many. Nonetheless, life slowly gets better for most of us. I’ll just make a passing remark about the US economy. Even in times of recession Americans have a quality of life that is better than that of kings 100 years ago, so the improving US economy and record highs for the Dow are just blips in the big picture. The Ebola outbreak was tragic. Nonetheless, there were positive glimmers, especially Nigeria’s coordinated response. And overblown fears of a pandemic proved ludicrous. People bemoan the state of Palestine-Israel relations, but few see recent times in the larger historical context. Before Camp David there were major wars in ’48, ’56, ’67 and ’73. Since then there have been missiles and terrorists, incursions and intifadas, but no all-out wars. The conflict seems intractable, but its scope continues to shrink. Russia, such a nuisance through much of 2014, now seems a paper bear with gas prices and the Rouble tumbling. The opening of Cuba bodes well. Communism, like mold, thrives in closed spaces. The feeble Castros can only hold on for so long. ISIS’s luck is running out, especial as air strikes continue to weaken its infrastructure and the Iraq government shows some modicum of competence post-Maliki. Tragedy will continue in Syria, and Venezuela looks ripe for some kind of change. Despite cops and black men being unjustly shot, America and the world are actually getting safer. And richer, freer, more equal, more democratic, more literate, longer lived, better educated and healthier. Here’s to an even better 2015. The way nudges work is that governments and organizations set up “decision architecture” such that the default option–or an easy option–has a socially beneficial outcome. A well known nudge is making the default option in organ donation “yes.” (In the past the default option was nearly always “no organ donation.”) A more whimsical one is to put some kind of target–say a picture of a fly or seashell–inside men’s urinals to induce them to aim better. The most important findings of behavioral economics are that humans often do not make rational decisions…but they’re predictably irrational (in the words of scholar Daniel Ariely). Scientists like Amos Tversky and Daniel Kahnemann pioneered studies that showed subtle biases and decision-making “errors” that humans make in some situations. That said, just as we are sometimes led astray, we can use behavioral economics to unconsciously guide people to make prosocial decisions while allowing individuals freedom and control to make decisions. Now these behavioral economics inspired nudges are not going to end malaria or cure cancer, but this kind of clever policy making can have an impact. Nudges like these can get well-meaning programs–like the female condom scheme in Zambia–to perform better. And while I don’t think that a sticker encouraging Americans to yell at drivers would work in our culture, I do like how the Kenya government encouraged its citizens not to stand for dangerous behavior. At their best, nudges get people to make small, prosocial decisions at the grassroots level. Like the improvements in life that this blog chronicles, nudges bubble up from the bottom and make the world a better place. Significant decreases in extreme poverty, hunger, child labor, child mortality, death in childbirth, teen births (US), smoking, war, homicide, violent crime, nuclear weapons, and share of income spent on food. Significant increases in life expectancy, leisure time, literacy, IQ scores, democracy and internet access. People are getting taller and staying in school longer. 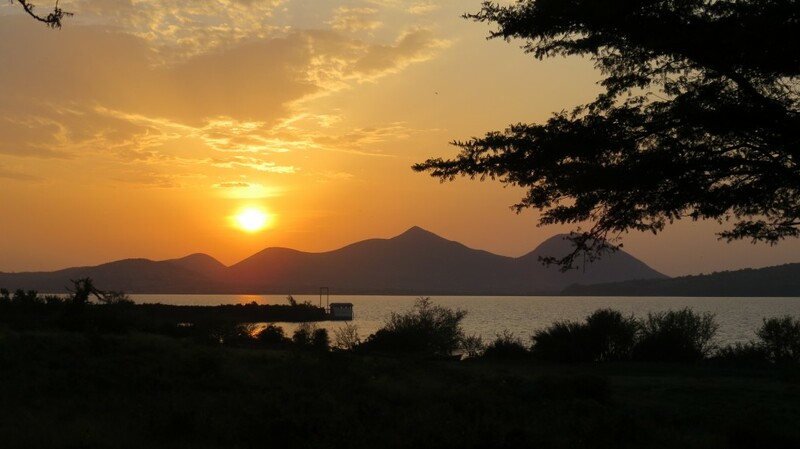 Guinea worm is almost eradicated–and Guinea Worm is a really bad parasite–Homelessness in the US is down.